One of my first fashion memories as a young boy involves my glamorous grandmother stepping off the airplane in Cincinnati swaddled in a fur-trimmed leather coat and matching fur hat. She and my grandfather had retired to Phoenix, and she was now working part time in the local department store's "fur vault." I remember being mesmerized by the touch and the look of the fur, never making any connection between this sensual "fabric" and where it came from. This was the mid-sixties, when owning a fur was considered de rigueur for women of a certain social status, and my grandmother, my first fashion muse, was right in step with the mood of the day. By the time I made it to New York City to pursue a career in fashion in 1986, the mood was quite different. Fresh from Harvard, where I studied sociology, I was now a full-time student at the Fashion Institute of Technology, immersed in tailoring and draping by day, and night-clubbing by night. While fur coats were still being worn uptown, the new guard of downtown fashionistas eschewed fur as politically incorrect, cruel and out of touch. There was a palpable shift in attitudes around fur and many designers, Calvin Klein and Ralph Lauren, for example, publicly went fur-free. It was during this period of the late 80s and early 90s when Naomi Campbell and other supermodels of the day posed in a Peta campaign announcing they would rather go naked than wear fur. Starting my own collection in 1993, I worked mostly in humble wools and cottons. By the mid-90s my momentum grew, and I was showing menswear collections at New York Fashion Week inspired by everything from "Forrest Gump" to Tom of Finland. As my company expanded, I added a women's collection to the brand and in 1997, moved all of my production to Italy, the mecca of high quality fashion manufacturing. With this move, suddenly everything was available to me, material wise, and I started using a lot of leather and suede, and eventually fur. By the late 90s, the buzzwords "ladylike" and "luxury" dominated the women's editorial and retail world. In response to the upcoming lady-luxe movement, I found myself drawn to the Maysles brothers' documentary "Grey Gardens" and the theme of fallen socialites. Much like the thrill of having a grandmother who wore a banana yellow mini-dress to my first communion, I had again found a personal muse who captivated my imagination, this time in the form of little Edie Beale. I liked the idea of presenting uptown clothes with a twisted downtown edge, and subsequently Little Edie and her fur coat found their way onto my inspiration board. And as a designer looking to make it in the luxury market I decided to add a fur coat to my collection. I remember feeling quite uncomfortable staring at the rabbit skins in my design room. Although I could not put my finger on it, I felt I was doing something against my better judgment, but forged ahead knowing that, if nothing else, it would be a great show stopper on the runway. With encouragement from my design team, I created a graphic black-and-white rabbit fur chevron coat that model Erin O'Connor worked down the New York Fall 2000 Fashion Week runway. While my fabulous rabbit fur coat was making the rounds at Vogue and Harper's Bazaar, a video landed on my desk from cruelty-free designer Stella McCartney. In association with PETA, Stella narrated an incredibly graphic video that documented the horrific realities of the fur industry. Apparently a copy of the video was sent to each designer on the New York Fashion Week roster. After watching the video, I quietly resolved never to work in fur again. The almost tactile vision of my grandmother in her fur pieces now was stained red and I would never be able to look at fur without seeing the inherent suffering behind its crafted beauty. Making the connection between a sumptuous fur coat and the many animals gassed, electrocuted, trapped or strangled to create that garment came into perfect focus, and I felt ashamed by my choice to show fur. But I was moving in a different direction than the rest of the fashion industry at this point. And in 2010, Eric Wilson, then a fashion critic at the New York Times,reported that more designers than not were using fur. He surmised that almost two-thirds of designers showing in New York were showing fur pieces. One reason? The fur-marketing company Saga, which represents fur breeders in Finland and Norway, had started to openly court up-and-coming designers, providing free trips to Copenhagen to present state of the art technology for making fur garments, and essentially giving them free product and support for their runway shows in return for the public relations. (Naomi Campbell even re-embraced fur, and had a fur coat named after her in Dennis Basso's collection.) Suddenly, many designers who had never shown fur were creating collections dripping in raccoon tails and coyote knitted vests. I was stunned. And this surprising -- and to me, really disturbing -- upswing in fur ultimately pushed me even further toward reconsidering my own personal choices, and I became vegan. To better understand this fur-frenetic phenomenon, I went looking for other designers to talk about their decision to use fur. Most -- even some I'd known for years -- just wouldn't talk to me about it. Only Ralph Rucci agreed to meet with me. Ralph Rucci is a master class American designer who has shown couture collections in Paris and is carried in the world's most desirable stores such as Bergdorf Goodman and Neiman Marcus. He has been in business for over 30 years, and has been using fur as part of his collections for the last 14. From Ralph Rucci's Fall 2013 collection. When we sat down to talk, Ralph and I both admitted to feeling a bit nervous. 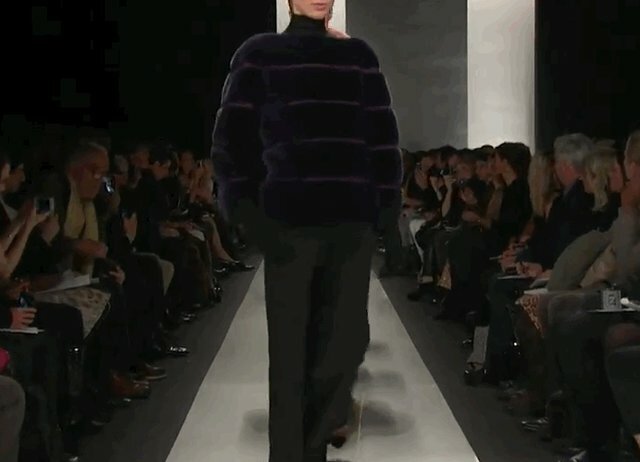 I had become a very outspoken fur-free designer and Ralph's Fall 2013 collection included a large fur statement, in every color of the rainbow. Ralph was very clear and knowledgeable about his domestic sourcing of foxes and minks. I learned that fur for Ralph is a tool employed for "creating something of beauty" and he approaches fur as fabric. "I don't do this to sell fur" he explained, "I do this to create more objects of beauty and luxury." As a designer who approaches fashion as an art form, Ralph believes "its about a painting -- painting a canvas with fur." I am incredibly grateful to Ralph for sharing his personal experience designing in fur, and the conversation helped me to acknowledge the exceptional craftsmanship that can be achieved with using fur. I just couldn't get myself to admire the skill and beauty that goes into a garment while ignoring the story behind it, the quite literal source material. I no longer understand how anyone can. As a fashion designer and animal activist, I have adjusted my own approach to design in order to accommodate my belief that animals are not ours to use in any way. I still have a license to design and create leather belts, which was signed before my vegan tipping point. But I no longer use any animals or animal byproducts (including wool, down, silk) in my own eponymous collection. I have been able to find organic cottons, sustainable linens and recycled synthetics that excite me as much as the suedes and leathers (and furs) from the past. For my Fall 2012 collection, for example, I received a grant from Lexus to create a responsibly sourced, cruelty-free collection. 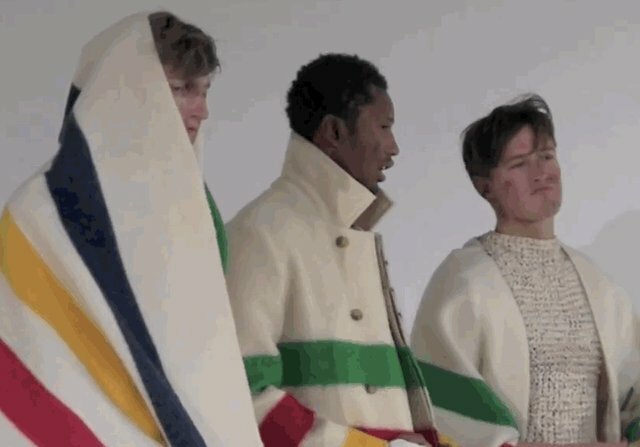 The result was up-cycled wool tailoring from vintage blankets, ultra suede biker jackets created from recycled television screens and lots of organic cotton long johns and union suits. While no longer relying on the "wow" factor of a fur piece to excite the customer, I enjoy the newfound freedom knowing my work is not hurting anyone. Meanwhile, there is this growing awareness in our society recognizing our relationship to animals and how they are institutionally enslaved by many industries. It has been exciting to see Hillary Clinton and the royals get behind the fight against the ivory trade and to see the impact of films like "Blackfish" on the world of entertainment that creates profit at animals' expense. Groups like Mercy For Animals and Farm Sanctuary are spearheading a more compassionate perspective for farm animals and many people are adopting a plant-based diet in solidarity with their animal friends. But sadly, the fashion world -- so forward-thinking in many ways -- feels behind the curve with regards to a more compassionate and open dialog about animals. And you'll likely see much more evidence of that this tomorrow, when New York Fashion Week kicks off. As reliant as we, as an industry and culture, are to certain animals, these sentient beings are still viewed merely as raw material. While the fashion industry has led the way in raising funds and awareness for the public health crises AIDS and breast cancer, among others, and responds immediately to national and international disasters with fundraising initiatives, there's a strange blind spot here. Much like haute cuisine chefs who will not stray from certain cruel traditions, fur stands out as the "foie gras of fashion" and seems almost off-limits as a category for debate. As an activist I can attest to the fact that those of us who are embracing a fur-free world are viewed as outsiders who have very little effect on the larger fashion system. But as a designer, I do get the sense that many fellow designers who use fur are conflicted about it and would happily walk away from fur once the fashion pendulum swings to a more humane platform. In order to really move the fur free needle, I believe it's going to take one of fashion's handful of game changers to publicly abandon fur and come out as a true animal ally. Many designers who use fur also profess to be animal lovers. And yet that love is typically reserved for domestic pets, horses and other companion animals. 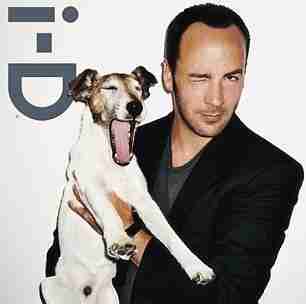 I feel confident that if our industry's greatest game changer --Tom Ford, himself an avowed animal lover -- came out against fur and banned it from his collections, that the fashion industry would follow suit. Tom is one of our industry's most visionary voices, and while many are hesitant to challenge the status quo, Tom is fearless in his choices. I could easily imagine him rousing the industry from its sleepy denial that true and luxurious style can be achieved without causing suffering to our animal friends. It would be a major fashion moment! What do you say, Tom?